I won’t spend too much time on this subject as I like the image to speak for itself but these two books are specific to my journey as a writer. I walked into the library today and saw two books on display that jumped out at me. 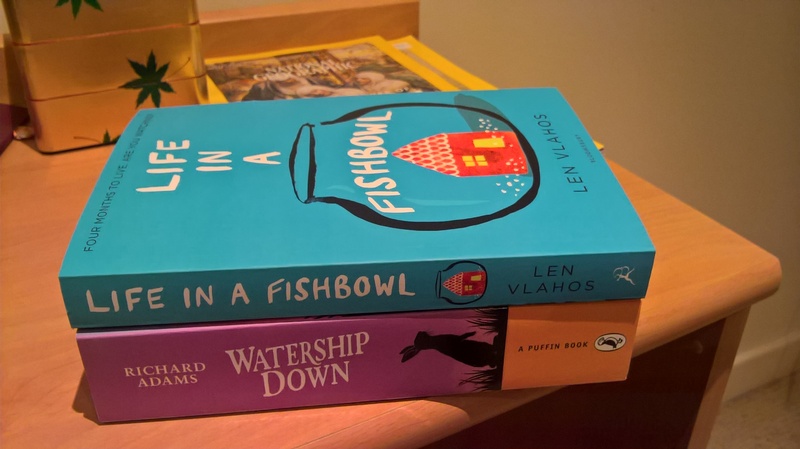 The first book was ‘Life in a Fishbowl’ by Len Vlahos and what is specific about this book is that my novella 369 (soon to be renamed Redemption) has a similar structure. Both male characters are diagnosed with a terminal illness. I was a bit concerned writing about such a heavy subject, that I had no experience with, so it was nice to see another writer tackling it in a dark but humorous way. The other book was Watership Down by Richard Adams another animal allegorical tale like Once When We Were Human. I decided to buy them both so I could study the flow of the sentences, how the author defines the character’s world and how he fleshes out the characters. I have been told it is handy to study similar books in your genre. Of course, they deviate wildly in the sense that 369 takes on a darker tone, and has the theme of redemption for the father who is an alcoholic, but for me it is about feeling the finer nuances of each sentence as they ebb and flow on the page. When I ‘read to learn’ I read slower than I normally would. I look at the words chosen, how a character is described and how the world around them unfolds. I look at the commas and full stops and other punctuation that is used to break up and make a sentence more active. Watership Down by Richard Adams is an absolute classic and is also important as my other book Once When We Were Human is also an animal allegorical tale, and I will learn heaps about how he writes about his animal characters, and brings them to life. Does he worry about what an animal can actually do? Should they be doing human things and will it bother the reader? It’s tough dealing with animals and how far one goes to make them appear more human. But of course, the underlying meta-physics utilized when dealing with animal characters is a great way to get a message across. It’s really important if you are writing in one genre to study other books that are your competition. Reading as we know in general is a required habit for a writer but reading to learn is a required skill that is needed so you study the other writers style as you read.